Yikes! 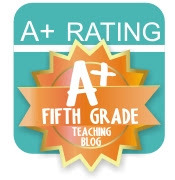 I'm terrible at keeping up with the blog during the school year. I tried, but failed at doing better. Sorry! Honestly, our year has been crazy busy between the lil nugget's schedule and my husband's NASCAR schedule; not to mention the hectic daily classroom happenings! I'm thankful for the blogging break because I'm rejuvenated and ready to share what I've been up to in the classroom and TPT land! 1st up...Erin Condren Planner: Here is a picture of my teacher planner from a few years ago. When I first got the planner I was smitten with every flashy detail the planner had. Honestly, I think I was more excited to have something people around me didn't have than the actual planner. Sad truth, but I want to keep it real for ya'll. Click here to preview the planner and see how in all actuality I didn't use many of the "extras" Erin Condren is known for. I did enjoy a few of the flashy features such as the pocket folder, clear page inserts and the small bag at the back of the planner. The EC planner sells for $55-$75. In my opinion it's not worth the money. Especially since the style has changed and the covers are interchangeable. I purchased an EC life planner and it's been a huge waste of money! The covers fall off...annoying to say the least, and I realized I'm a digital calendar person for all things social in our life. 2nd up...Teacher Anchor Planner: Last year I had the pleasure of winning this beautiful planner from CJayneTeach in an Instagram contest. I didn't know anything about the product and was just super excited to win a "teacher prize"! I won a beautiful binder as well as the planner. This planner looks very much like a printer friendly version of the EC planner in my opinion. There's nothing cutesy or colorful about the planner on the inside. It differs from the EC planner because it does have CCES listed for K-2 as well as tips to being more efficient with planning efforts. When you check out the preview you will see I used parts of the planner, but then ended up just stapling purchased lesson plans on the pages. It became a glorified binder with pages everywhere! The planner sells for $56, but again...I'm not sure it's worth the money; at least not in MY opinion. Click here to check out the inside of the planner. 3rd up...Create 365 Happy Planner Teacher Edition: Ok, so this planner was just gifted to me by my mom as a thank you for helping out when my nana unexpectedly died last month. We stumbled across this planner on accident when wondering around Hobby Lobby for a few brag tag accessories to end the school year. I'm super excited about this planner because it seems to have the EC flair, with a teacher price tag. The best of both worlds, right?! The planner retails for $29.99. You can use a trusty 40% off coupon to make the price even more affordable. You can check out the planner by clicking here. Below are a few pictures of the planner, accessories purchased at an additional charge, and my stamping catastrophe with the checklist stamp. Currently, I'm uncertain of my feelings with the stamp because of the unpredictability of stamping the entire stamp image. Hopefully, the more I use it, the more accurate the stamping will be. There is one other stamp I wanted to complete the planner, but my Hobby Lobby didn't have it. Luckily, my mom's HL did and she is bringing it to me in August. :)) In my humble opinion, this planner is the best of all of the worlds and is 100% worth the money! The word on the street is it sells out quickly; however, is replenished often. 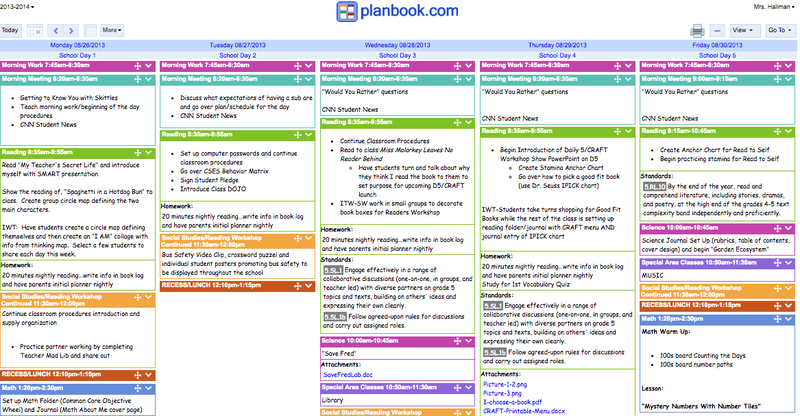 4th up...Planbook.com: Ok, so I used planbook.com for one school year. It was ok, but I didn't feel like I was ever really prepared to teach. I think for me, the price was right, but I'm a person who needs to write out the game plan to own and execute it. From an administrator's perspective, planbook.com is genius and every teacher should use it because it's legible, can be shared with administration/special area teachers, can be CC aligned, and allows you to view all plans (old and new) with a few clicks from a device. Some of the features that are helpful as a teacher are the lesson sharing options, CCES objectives just a click a way to adding to your plans, and the links/files you can attach to each block of your day. You can also repeat activities each week if your classroom has certain procedures/activities that are the same. I used the app version on my personal iPad as well as had it on my SMART board in the background, so I could click on links/resources as needed throughout the day. This style of lesson planning is good for mapping out your weeks, but I still needed the process of writing things down to be successful at executing the plan. Below is a screen shot of my first week plans when I taught 5th grade. The cost is $12 a year. If you choose not to renew your subscription, you still have access to your old plans, you just can't edit them.